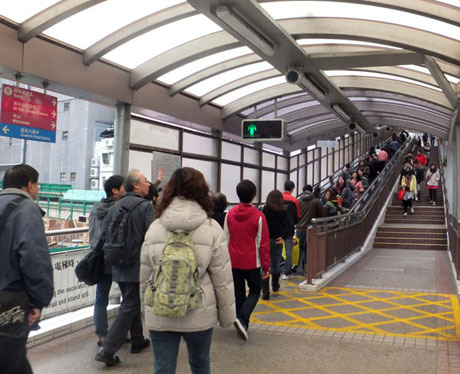 The Central – Mid-Levels Escalator system, is the world's longest outdoor covered escalator system, stretching for over 800-metres and rising 135-metres through the streets of a steep hillside linking these districts of Hong Kong Island. It was opened in October 1993, having cost HK$245 million to build, six times the original estimate. 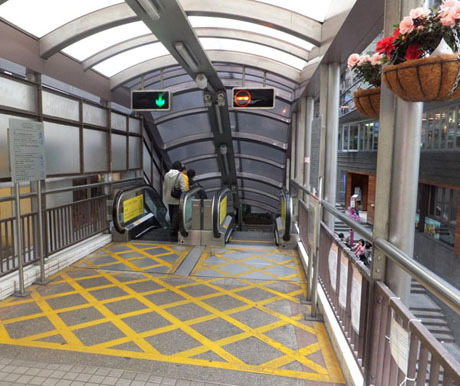 The system is not a single continuous escalator, it is a series of 20 escalators and 3 inclined moving walkways (travelators) , connected in places by footbridges, and with 14 entrances and exits. To ride the complete length of the escalator system one-way takes about 20/25 minutes. The project, originally known as the “Hillside Escalator Link”, was controversial and, in its early days, was considered a “white elephant”, having failed to achieve its main objective of easing traffic congestion between Central and Mid-Levels. However, providing an effortless free method of transportation between these districts for residents, commuters and tourists alike, patronage has grown to about 78,000 people daily, three times the original estimate, and the system has served to open up and dramatically revitalise the areas through which it passes. For visitors, a journey on the escalators offers an excellent opportunity to explore the busy, bustling streets of Central, Hong Kong's oldest market district and famous antiques and art district, museums, historic buildings and the contrasting, more relaxed environment of Mid-Levels. The escalators run from Queen’s Road Central to Conduit Road in Mid-Levels. 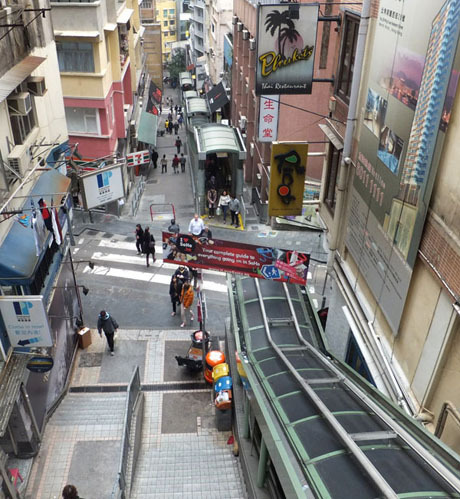 Owing to limited space in the narrow streets it wasn’t possible to build two escalators and so the escalators travel downwards from Mid-Levels from 6am to 10am daily, enabling commuters to reach their offices in Central and, after 10am, the flow is then reversed so that the escalators travel uphill until midnight. 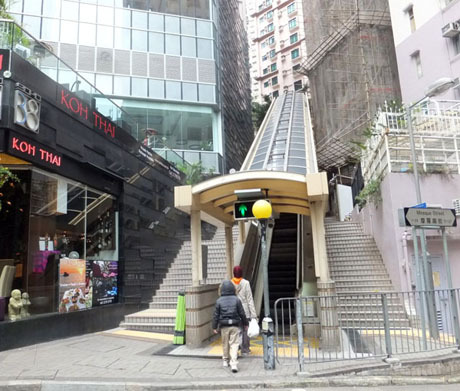 A second, 800-metre continuous escalator travelling between Conduit Street and Centre Street in Sai Ying Pun was proposed in 1993 with completion to coincide with opening of the nearby Western Harbour Crossing in 1997, but the project did not proceed. 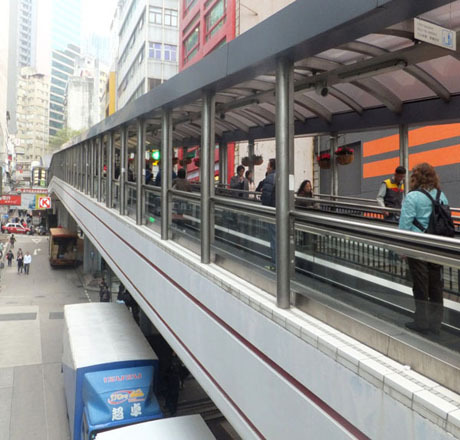 More recently, in 2011, plans still under consideration have been put forward for an 880-metre “second Mid-Levels escalators” linking Conduit Road with Queen’s Road West near Sheung Wan Municipal Services Building and connecting to Hong Kong Macau Ferry Terminal via footbridge. 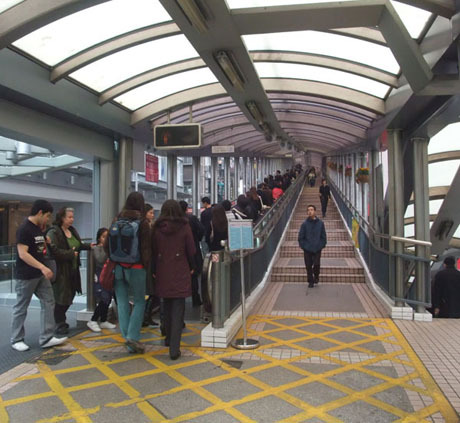 From 10am the direction of travel of each set of escalators and travelators is reversed in sequence starting from the top of the system at Conduit Road, taking about 20/25 minutes for the final travelator connecting Wellington Street with Queen's Road Central to be reversed. The escalator system starts alongside 100 Queens Road Central at its junction with Cochrane Street. It can be accessed either by escalator at the side of the main entrance to 100 Queen’s Road Central or by steps from Cochrane Street leading up to the footbridge across Queen’s Road Central. 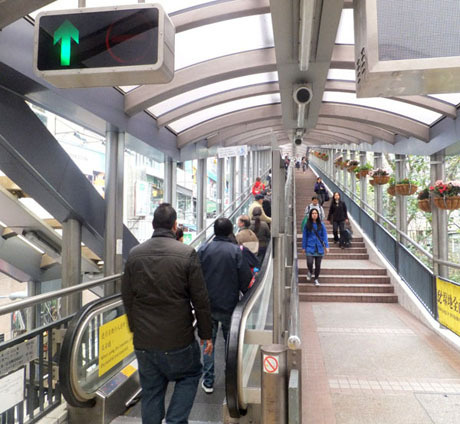 The escalators can also be accessed via the elevated walkway system which leads from Level 1 exit of One IFC/IFC Mall over Connaught Road Central and Des Voeux Road Central and through Central Market arcade to Queen’s Road Central. On the opposite side of Queen’s Road Central to the beginning of the escalator system is Central Market, which was built in 1938 in Bauhaus style as Canton Bazaar. Its design was based on London County Council by-laws of 1915 and it replaced previous markets dating back to 1858 and 1895. It was, at one time, the largest meat market in Southeast Asia but closed in 2003. 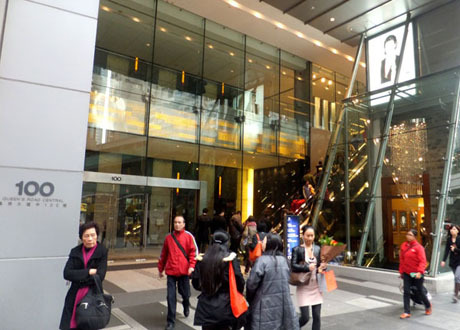 It is currently undergoing a HK$500 million renovation which will see it become a “green oasis” in the heart of the city with shops, restaurants, courtyard and rooftop garden and is planned to reopen in 2015. The system begins with a moving walkway running up Cochrane Street and across Stanley Street, with its hawker stalls, dai pai dongs and Chinese herbal tea shops to a footbridge over busy Wellington Street which has a mix of old and new buildings housing shops, offices, cafes, restaurants and the rather shabby Lin Heung Teahouse (no 160-164), dating back to 1928 and famous for its dim sum and eight treasure duck. Above Wellington Street, the second moving walkway continues up Cochrane Street, across Gage Street to a footbridge across Lyndhurst Terrace. 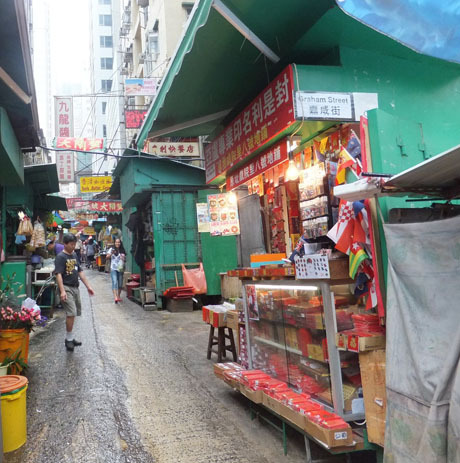 On the right hand side of this section is Hong Kong’s oldest street market, Central Street Market extending along Peel Street, Graham Street and Gage Street, with about with about 130 licensed fixed-pitch hawker stalls. This market is in the centre of an old neighbourhood and still maintains the feel of “Old Hong Kong”. Lyndhurst Terrace was built in the 1840’s and in the late 19th century was notorious as a “red-light” district with European brothels. 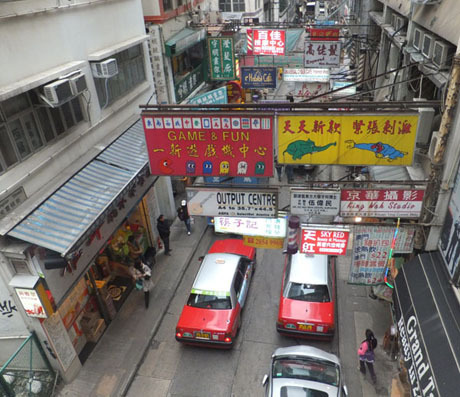 Nowadays it is known for its excellent and inexpensive picture framers and as the location of Tai Cheong Bakery, whose egg tarts were famously described by Hong Kong’s last governor as the best in the world. 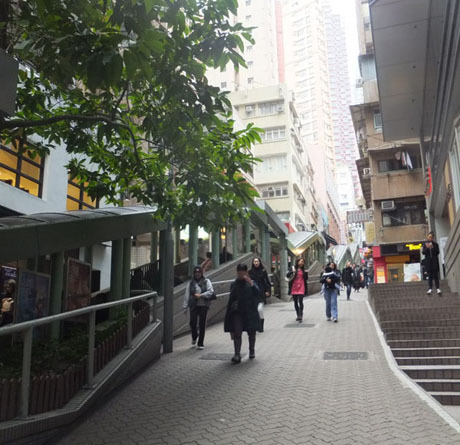 Above Lyndhurst Terrace, the third moving walkway continues along Cochrane Street, to its junction with Hollywood Road, and a footbridge crosses and runs along Hollywood Road for a short distance to Shelley Street. 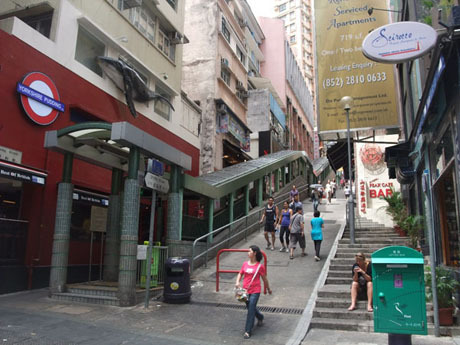 The first set of escalators travelling towards Mid-Levels, actually travels downwards, a short distance, to Shelley Street. 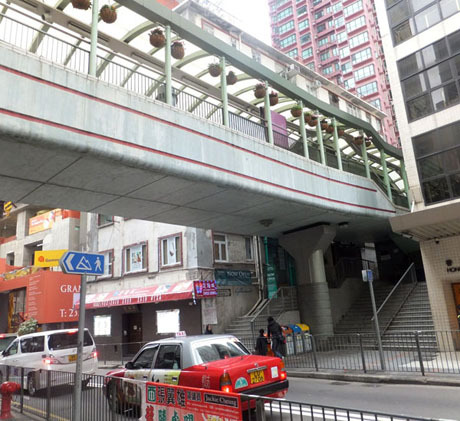 On reaching the footbridge over Hollywood Road, the disused four-storey colonial Central Police Station, with its grey/blue colour scheme and distinctive Doric columns is clearly visible on the left. 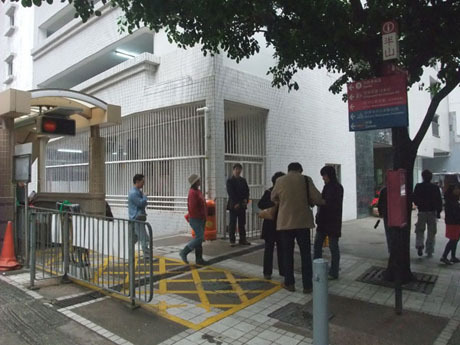 The police station dates back to 1864 and was the Hong Kong Island Regional Police Headquarters and Central District Police Headquarters until its closure in 2004. Together with the adjacent former Victoria Prison and stable blocks it is subject of a HK$1.8 billion conservation and revitalisation project which will see it transformed into a heritage, arts, cultural and tourist hub, expected to open in 2016. 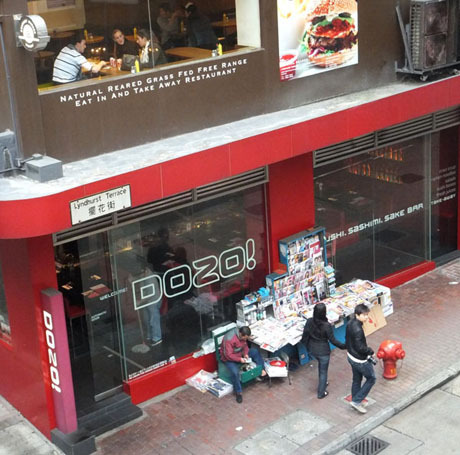 A little further west along Hollywood Road at its junction with Aberdeen Street another conservation and revitalisation project, costing about HK$420 million has seen the Former Police Married Quarters (previously the Government Central School) become a creative industries centre, PMQ, which soft opened in May 2014, with130 studios for retailing creative products, a creative resource centre and 6 studios for resident artists. 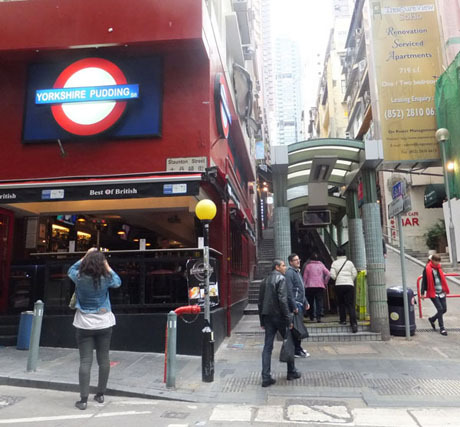 Hollywood Road was one of the earliest roads to be developed in Hong Kong and the western end is where colonial Hong Kong began, at Possession Point, near Possession Street where, in 1841, the Union Jack was raised to claim Hong Kong for the British following the Opium War with China. Possession Point no longer exists but a display of photos inside nearby Hollywood Road Park show where the flag was raised. Hollywood Road is named after the country estate of the second governor, Sir John Francis Davis, Hollywood House in Ireland. It is the main street for antiques shopping, being lined with shops and auction houses dealing in all types of antique including porcelain ware, sculptures, statues, Chinese furniture, rugs and curios. More latterly the street has become known for an ever growing number of contemporary art galleries. About 350-metres west from where the footbridge crosses Hollywood Road is the Man Mo Temple, one of Hong Kong’s most popular tourist attractions, built in 1847. Man Mo means “civil and martial” and the temple is dedicated to two Daoist deities, Man Chung, the god of literature, and Kwan Kung, the god of martial arts. A short distance down steps on Ladder Street, opposite the temple, is another tourist attraction, Upper Lascar Row, better known as “Cat Street”, location of a street bazaar of antique and curio shops and stalls. In the 19th century this area was unsafe for Westerners to visit, being an area of ill-repute frequented by opium addicts, prostitutes, thieves and gamblers. The street took its name from Indian sailors, known as “lascars”, meaning an East Indian sailor or army servant, who lived in nearby boarding houses whilst waiting for a berth on a ship. From the footbridge over Hollywood Road a short set of escalators leads down to Shelley Street, where the long series of 20 escalators leading to Mid-Levels begin. The first set of uphill escalators runs up Shelley Street to Staunton Street. Here, the escalators enter the district known as SoHo (South of Hollywood Road), once a quiet traditional district with shops selling funeral items, which now rivals nearby Lan Kwai Fong as Hong Kong’s entertainment and night-life district. Bars, restaurants and cafes, busy day and night, line both sides of the escalators on Shelley Street and both sides of Staunton Street. During the mid-19th century, Staunton Street was where a French religious organisation, Etrangeres de Paris, established their first headquarters, from where Catholic priests organised missionary activity throughout China. From Staunton Street the next series of escalators continues up Shelley Street past more bars and restaurants to its junction at Elgin Street, named after Lord Elgin, British envoy to China in the Second Opium War of 1857-1860. Elgin Street is also part of SoHo district and lined with more bars and restaurants. From Elgin Street, bars and restaurants start to thin out as the escalators continue the climb up Shelley Street, to its junction with Caine Road. On reaching Caine Road, passengers on the escalators must take a “U-turn” to the footbridge over Caine Road, which connects the escalators with the next set of escalators from Caine Road to Mosque Street. Caine Road was named after a British Army Major, William Caine, the first magistrate in the colony and founder of the Hong Kong Police Force, whose reputation for liberal use of the rattan cane made him a feared but respected official. 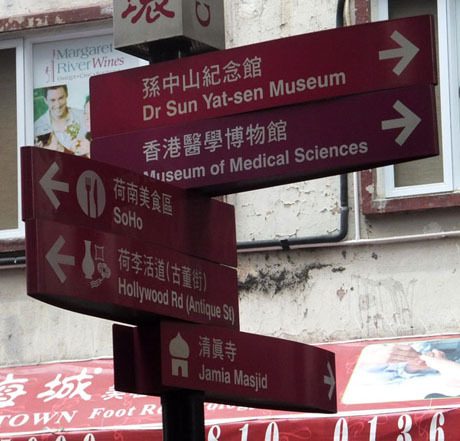 Of particular interest to tourist are the Dr Sun Yat-sen Museum, about 200-metres west of the escalators at Castle Road, just off Caine Road to the south and the Hong Kong Museum of Medical Sciences, a further 300-metres distant at Caine Lane, just below Caine Road. The Dr Sun Yat-sen Museum opened in 2006 in the magnificently restored Kom Tong Hall, once the family mansion of Ho Kom-tong, brother of the magnate Robert Hotung and comprador of Jardine Matheson and Co, and celebrates the life of “The Father of Modern China”. The Museum of Medical Sciences is located in a renovated Edwardian building, formerly the Pathological Institute and displays the history of both Traditional Chinese and Western medicine and the development of medical and health sciences in Hong Kong. Above Caine Road, passenger traffic quickly thins out as the area becomes quieter and more residential as the escalators continue up Shelley Street to its end at the junction with Mosque Street. About half-way along this section, on the right, the escalators pass the oddly-named Rednaxela Terrace, which is, in fact, inadvertently named backwards as a result of a mistake by a Chinese workman tasked with painting the street’s name. 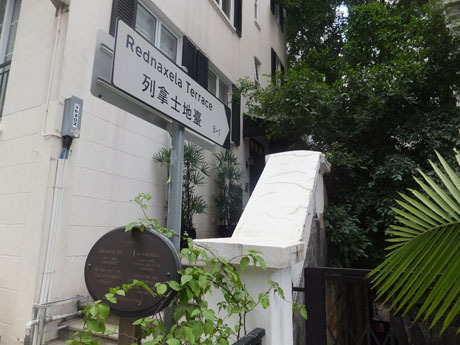 However, Rednaxela Terrace is more famous for being the home of Dr Jose Rizal, national hero of the Philippines, who lived there in exile at number 2 with his family from December 1891 to June 1892 and is commemorated by a plaque. Dr Rizal had fought for reform of the Philippines during Spanish colonial rule but was executed in 1896, an act which contributed to the Philippine Revolution. Dr Rizal was conversant in 22 languages and a prolific poet, essayist, diarist, correspondent and novelist whose most famous works were his two novels, Noli me Tangere and El filibusterismo. These social commentaries on Spanish rule formed the nucleus of literature that inspired peaceful reformists and armed revolutionaries alike. His place in history as one of the Philippines leading patriots is marked each year by a national holiday, Rizal Day, held on 30th December, the date of his execution. Almost opposite Rednaxela Terrace, to the left of the escalators, is the Jamia Mosque, the first mosque to be established in Hong Kong. The local Muslim community numbers over 100,000, many of whom have lived here with their families for generations. About half are of Chinese descent and the remainder from Pakistan, Malaysia and Indonesia. The present day mosque was built in 1915 on the site a former mosque built in 1850 and the minaret at the front of the original building still remains. The pastel green mosque, which is entered from Shelley Street through wrought-iron gates and a set of steps, has turrets, towers and stained glass windows and passers-by can often hear the incessant murmuring of prayers coming from the mosque which, as those bold enough to trespass will discover, is a tape recording. The final section of the escalator system runs from Mosque Street, and is linked by footbridge over Robinson Road and walkways up to the end of the system, adjacent to Conduit Tower at Conduit Road in Mid-Levels. This section is relatively uninteresting, being mainly residential areas of high-rise apartment blocks. 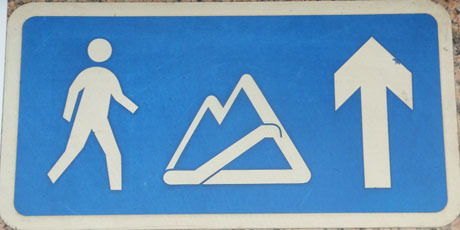 At one point just below Conduit Road, there is direct access into a Park ‘N Shop supermarket. 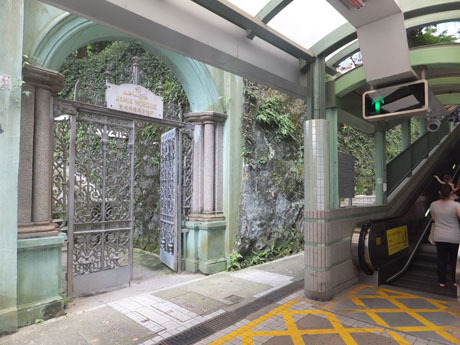 From Conduit Road, it is about a 15-minute walk to Hong Kong Zoological & Botanical Gardens and there are tourist direction signs from the top of the escalator system, although care needs to be taken when following the signs as some are partially obscured by foliage. WALK – the return walk down to Central follows steps and footpaths which mainly run alongside the escalators and to reach Queen’s Road Central takes about 20 minutes. GREEN MINIBUS – Green minibus number 3 stops on Conduit Road, about 20-metres from the escalators. 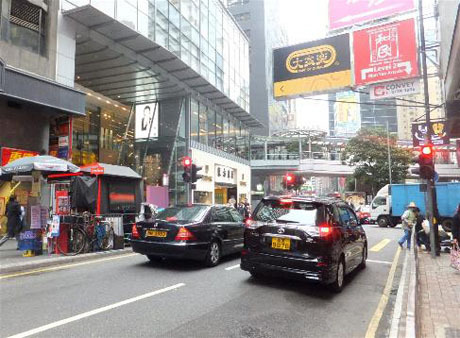 It operates at about 5-10 minute frequency and stops on Ice House Street and Pedder Street in Central (outside Central MTR Station), before terminating at Hong Kong Station Public Transport Interchange under IFC Mall. 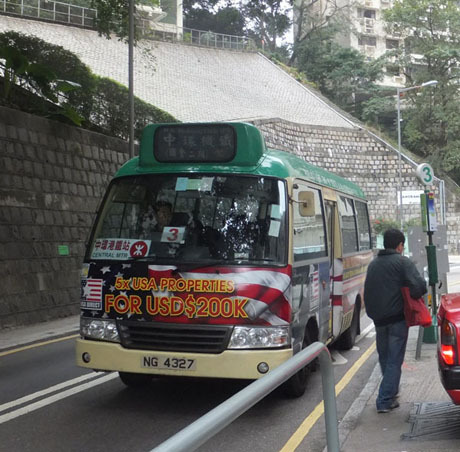 TAXI – There is an abundance of taxis travelling along Conduit Road and the fare to Central is about HK$40.